For the past three decades, bond markets have been on one of the most impressive bull runs in history. In fact, since 1987, bonds have returned 10% or more in 29% of calendar years compared to just 11% of the time between 1926 and 19861. As a result, investors have largely been able to meet their objectives using an intermediate-term core bond strategy. In today’s low yield environment, however, an intermediate-term bond allocation alone is unlikely to meet investors’ needs, as forward returns for bonds are expected to be muted with interest rates gradually rising off of historic lows. Despite the challenging environment, many investors will still need to look to fixed income as a source of income generation, growth, and diversification. While a traditional intermediate-term core bond strategy is unlikely to meet these needs, adding a high yield allocation may be beneficial. For investors looking to increase their income/return potential but are hesitant to increase their equity risk, or those looking to de-risk their portfolio away from equities but need higher returns than traditional bonds may offer, high yield securities could potentially serve as a middle ground. 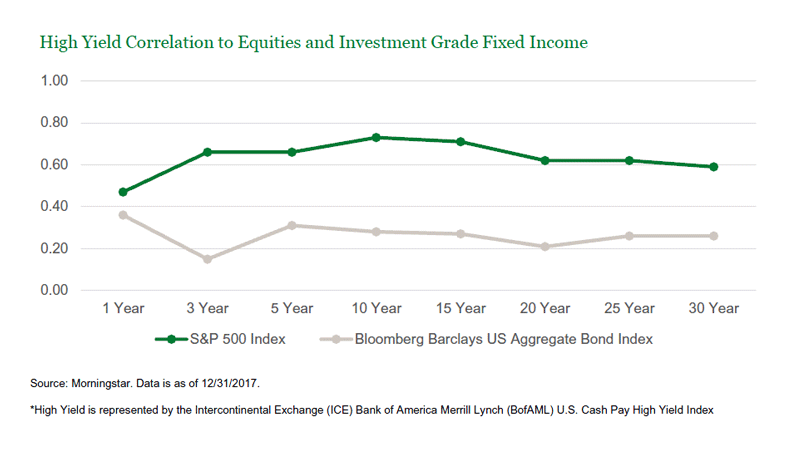 Compared to traditional investment grade fixed income securities, high yield securities offer higher levels of income and growth potential over time. In exchange for greater return potential relative to investment grade securities, high yield investors assume greater credit risk, or the risk of bond issuer default. Despite the increased credit risk, the default rate—3.6% as of February 2018—remains relatively low. In addition to higher return potential, high yield securities provide diversification benefits compared to other fixed income sectors and equities. Whereas many fixed income sectors are influenced by the interest rate cycle, high yield securities are more heavily impacted by the business cycle. With respect to equities, diversification is due to price declines of high yield securities being partially offset by income received on the bonds. The potential diversification benefits can be seen in the below chart illustrating the relatively low correlation of high yield securities to both equities and investment grade fixed income. Correlation as used here indicates the degree of diversification, with a correlation of 1 indicating no diversification, and a correlation of -1 indicating maximum diversification. With unique risk and return characteristics, high yield securities can best be described as a hybrid between equities and fixed income: similar to equities, high yield bonds have historically offered greater growth potential than investment grade fixed income; and similar to investment grade fixed income, high yield bonds have historically exhibited lower volatility than equities. When thinking about the risk/return profile of high yield, it has typically been thought of in the context of other fixed income sectors and is often perceived as a risky asset class. When looking at high yield from a total portfolio perspective, however, the benefits of the asset class become more evident. Specifically, its ability to help investors achieve their return goals with less overall risk than using equities alone. For some investors, high yield can potentially bridge the gap, mitigating some of the risks associated with equity markets (i.e., higher volatility, potential for more meaningful drawdowns), while generally offering higher returns than investment grade bonds. We see high yield as potentially having a wide appeal, but ultimately, when deciding where to allocate capital, investors should consider factors including, but not limited to, time horizon, risk tolerance, and risk capacity. Learn more about the Manning & Napier Fund, Inc. High Yield Bond Series. 1As represented by the Ibbotson Associates US Intermediate Government Bond Index. For more information about any of the Manning & Napier Fund, Inc. Series, you may obtain a prospectus at www.manning-napier.com or by calling (800) 466-3863. Before investing, carefully consider the objectives, risks, charges and expenses of the investment and read the prospectus carefully as it contains this and other information about the investment company. There is an inverse relationship between bond prices and interest rates; as interest rates rise, bond prices (and therefore the value of bond funds) fall. Likewise, as interest rates fall, bond prices and the value of bond funds rise. Investments in higher-yielding, lower-rated securities involve additional risks, including a higher risk of default and loss of principal. Please note that diversification does not assure a profit or protect against loss in a declining market. U.S. Intermediate Government Bond data is reflective of the Ibbotson Associates SBBI U.S. Intermediate-Term Government Bond Index, which is an unmanaged index representing the U.S. intermediate-term government bond market. The index is constructed as a one bond portfolio consisting of the shortest-term non-callable government bond with no less than 5 years to maturity. The Index returns do not reflect any fees or expenses. Index returns provided by Morningstar. The Intercontinental Exchange (ICE) Bank of America Merrill Lynch (BofAML) U.S. Cash Pay High Yield Index tracks the performance of U.S. dollar denominated below investment grade corporate debt, currently in a coupon paying period, issued in the U.S. domestic market. Qualifying securities must have at least one year remaining term to final maturity as of the rebalancing date, at least 18 months to final maturity at the time of issuance, a fixed coupon schedule, and a minimum amount outstanding of $250 million. The Index returns do not reflect any fees or expenses. Index returns provided by Morningstar. The S&P 500 Total Return Index is an unmanaged, capitalization-weighted measure comprised of 500 leading U.S. companies to gauge U.S. large cap equities. The Index returns do not reflect any fees or expenses. The index accounts for the reinvestment of regular cash dividends, but not for the withholding of taxes. Index returns provided by Morningstar. S&P Dow Jones Indices LLC, a subsidiary of the McGraw Hill Financial, Inc., is the publisher of various index based data products and services and has licensed certain of its products and services for use by Manning & Napier. All such content Copyright © 2018 by S&P Dow Jones Indices LLC and/or its affiliates. All rights reserved. Neither S&P Dow Jones Indices LLC, Dow Jones Trademark Holdings LLC, their affiliates nor their third party licensors make any representation or warranty, express or implied, as to the ability of any index to accurately represent the asset class or market sector that it purports to represent and none of these parties shall have any liability for any errors, omissions, or interruptions of any index or the data included therein. The Bloomberg Barclays U.S. Aggregate Bond Index is an unmanaged, market-value weighted index of U.S. domestic investment-grade debt issues, including government, corporate, asset-backed, and mortgage-backed securities, with maturities of one year or more. Index returns do not reflect any fees or expenses. Index returns provided by Morningstar. Past financial performance is no guarantee of future results. Morningstar, Inc. is a global investment research firm providing data, information, and analysis of stocks and mutual funds. ©2018 Morningstar, Inc. All rights reserved. The information contained herein: (1) is proprietary to Morningstar and/or its content providers; (2) may not be copied, adapted or distributed; and (3) is not warranted to be accurate, complete or timely. Neither Morningstar nor its content providers are responsible for any damages or losses arising from any use of this information, except where such damages or losses cannot be limited or excluded by law in your jurisdiction. The Manning & Napier Fund, Inc. is managed by Manning & Napier Advisors, LLC. Manning & Napier Investor Services, Inc., an affiliate of Manning & Napier Advisors, LLC, is the distributor of the Fund shares.